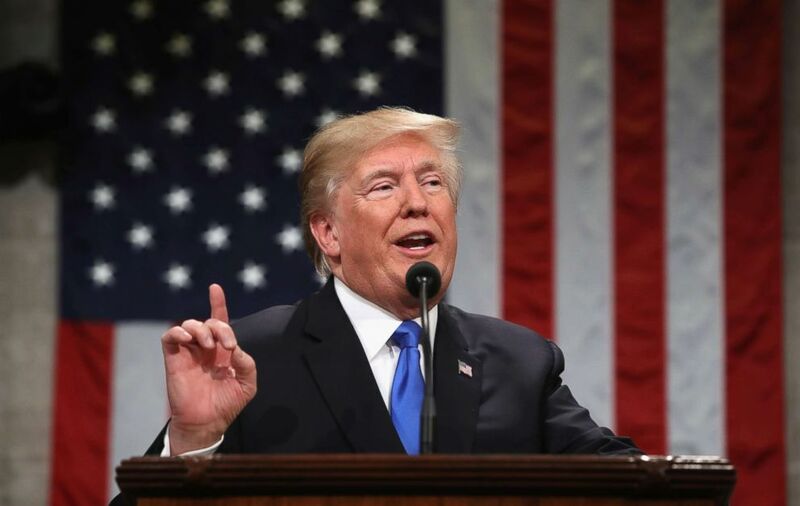 President Donald Trump on Tuesday night gave his second State of the Union address, one week after he originally was invited to deliver it but didn't because of the longest-ever government shutdown. 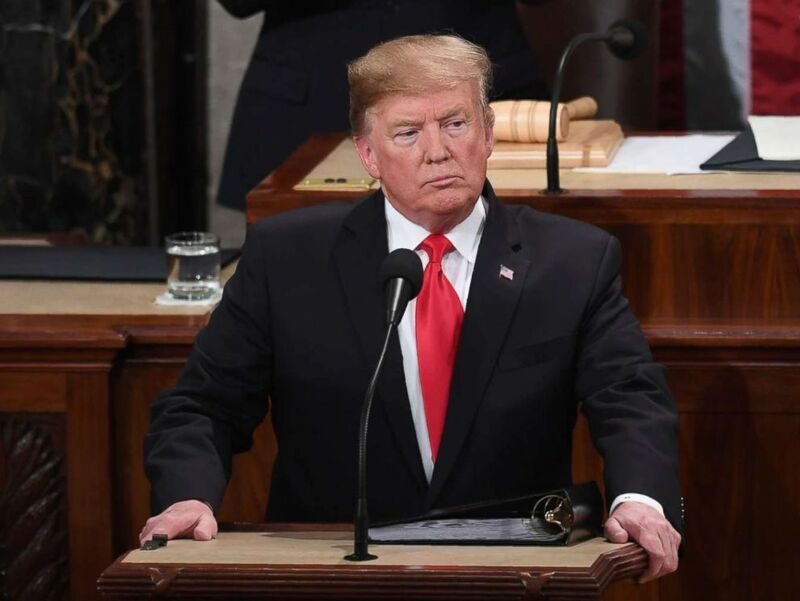 During the speech, the president stopped short of declaring a national emergency to obtain funds to build a wall on the U.S.-Mexico border without congressional approval. "In the past, most of the people in this room voted for a wall, but the proper wall never got built. I will get it built," he said prompting applause from Republicans. However, he did not directly threaten another government shutdown, though he called on both Republicans and Democrats to “join forces” and pass a bill in the next 10 days. It was the first State of the Union address Trump delivered before a divided Congress. Last year, the Senate and House were controlled by the president's own Republican party. This year, Democrats re-took the House. Trump also delivered his nearly 90-minute address to a House chamber filled with more women and people of color than ever before. 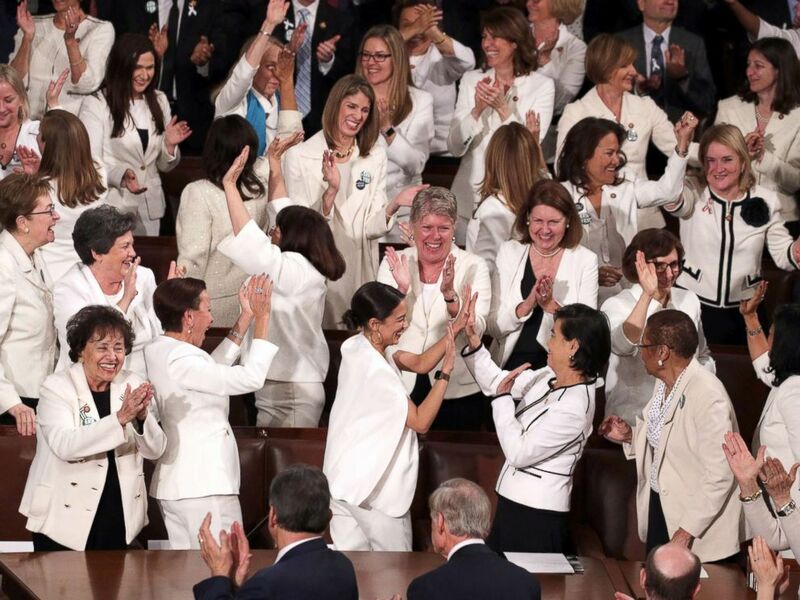 During the speech, there was a brief moment of unity propelled by congresswomen in white and their allies show solidarity with the women's suffrage movement. The speech came at a particularly tense period for Trump and Congress as it's been just a week since the government reopened after a 35-day shutdown and there are only 10 days until the government will shut down yet again if the president and Congress don't come to an agreement on border security. The journalists over at ABC News partner FiveThirtyEight are analyzing the president's foreign policy following the North Korea summit announcement. “We do not know whether we will achieve an agreement -- but we do know that after two decades of war, the hour has come to at least try for peace. And the other side would also like to see peace,” Trump said. “For years, politicians promised [Americans] they would renegotiate for a better deal. But no one ever tried -- until now. Our new U.S.-Mexico-Canada Agreement – USMCA – will replace NAFTA and deliver for American workers like they haven’t had delivered to for a long time,” Trump said. “I hope you can pass the USMCA into law so that we can bring back our manufacturing jobs in even greater numbers, expanding American agriculture, protect intellectual property, and ensure that more cars are proudly stamped with our four beautiful words: Made in the USA,” Trump said. “I want people to come into our country, in the largest numbers ever. But they have to come in legally,” Trump added. The president’s claims come as his administration has limited refugee admissions into the U.S. and restricted immigration from seven countries, five of which have Muslim majority populations. Our team of journalists from ABC News is fact-checking some of President Donald Trump's statements, looking for additional context, detail and information. Here is ABC News' fact check of the address. “Alice's story underscores the disparities and unfairness that can exist in criminal sentencing -- and the need to remedy this injustice,” Trump said. “When I saw Alice's beautiful family greet her at the prison gates, hugging and kissing and crying and laughing, I knew I did the right thing. 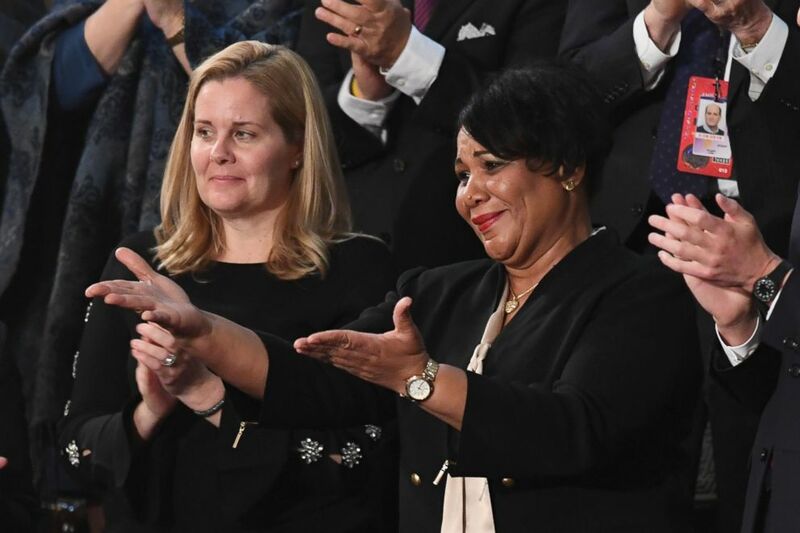 Alice Johnson, one of the President's special guests, reacts as the president acknowledges her during his State of the Union address at the U.S. Capitol in Washington, Feb. 5, 2019. 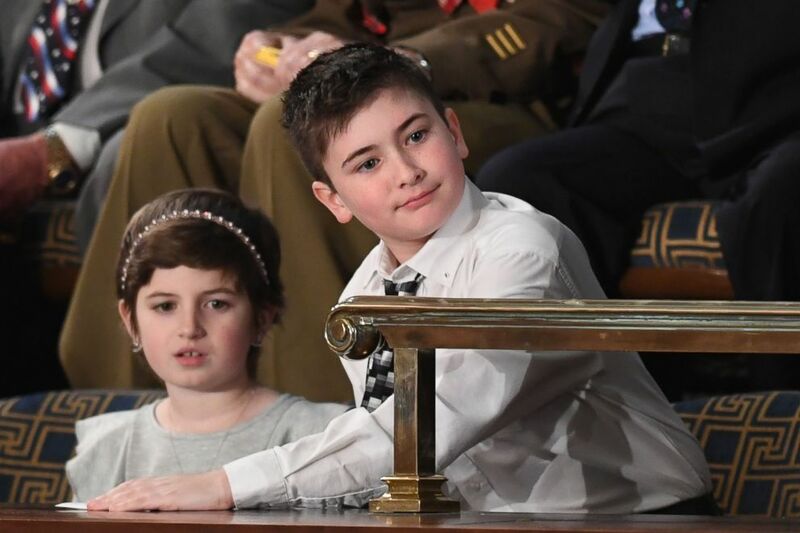 "That sounds so good," Trump said, veering off script in reaction to the standing ovation and chants, largely from Republicans, of "U.S.A."
The applause came after Trump's comments about the strength of the country: "After 24 months of rapid progress, our economy is the envy of the world, our military is the most powerful on earth, and America is winning each and every day. 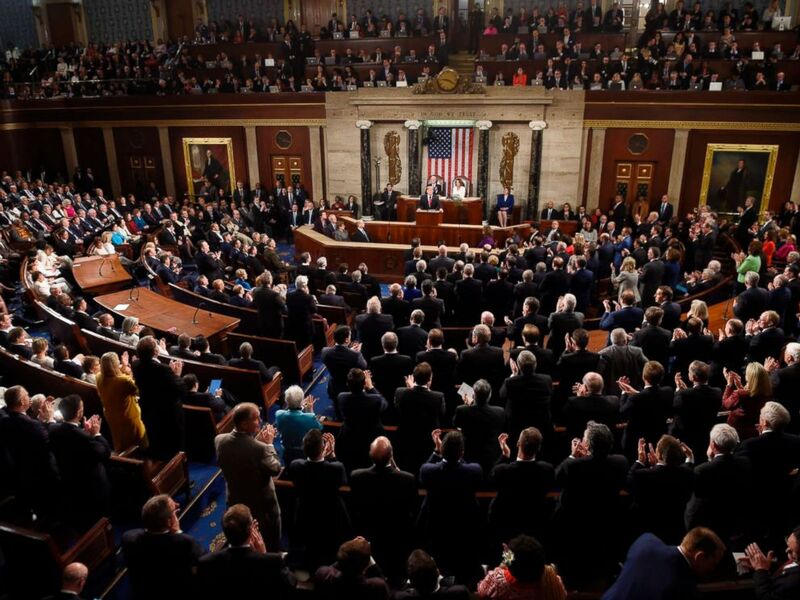 Members of Congress: the State of our Union is strong. Our country is vibrant and our economy is thriving like never before." The Trump family is already seated. Notably, Don Trump Jr.'s girlfriend Kimberly Guilfoyle and Tiffany Trump are both wearing white dresses -- the same dress code chosen by many lawmakers in a nod to the women's suffrage movement. 8:30 p.m.: ABC News' partner FiveThirtyEight begins their live blog of the speech. Follow their live analysis of Trump's speech here. This will be the first State of the Union for Kavanaugh, Trump's newest appointment to the court, and the first time both Kavanaugh and Gorsuch will be together in the chamber before Trump. Trump nominated Gorsuch to the court in 2016. Justice Ruth Bader Ginsburg, who made her first public appearance Monday night after cancer surgery in December, will not attend the address. She did not attend either of Trump's two previous speeches before a joint session of Congress. ABC News' Devin Dwyer reports. 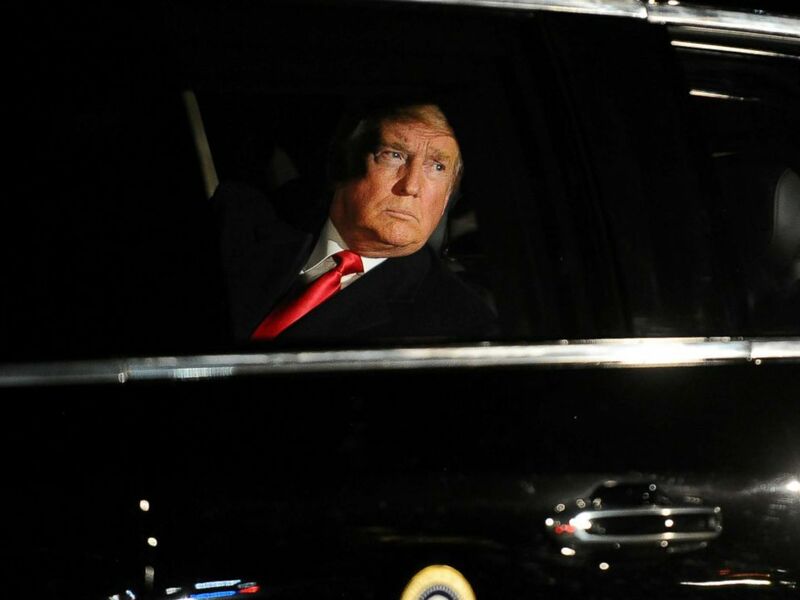 According to White House officials, the president as of Tuesday morning was not expected to make any official national emergency declaration, as he has threatened, in a move to obtain funds to build his border wall without congressional approval. And while the president won't explicitly rule out another shutdown, one senior official told ABC News that his address is "more of a unifying speech, saying he actually wants to get things done." "The president has said that he can do it," Conway said. "But he's never wanted to do that. He wants Congress to finish its work. He wants them to put a deal on his desk that he can sign." ABC News' Alexander Mallin reports. On the economic woes of working-class Americans -- a major campaign platform of 2016 and also a focus of last year's speech -- Trump will narrow in on trade deals, like the one his administration is working out with China after trading tariffs over the last few months, and he’ll urge Congress to approve the United States–Mexico–Canada Agreement, according to a senior administration official. On infrastructure, the president is expected to call for a dollar amount. Last year, he asked Congress to generate $1.5 trillion, per a senior White House official. On national security, the president will specifically address the political standoff between Venezuela's opposition leader Juan Guaido and President Nicolas Maduro. The White House classified this year's speech as "visionary" -- looking toward the future and presenting a "common-sense path forward" with a "very American and can-do optimistic approach." It's also going to be long, according to a White House official, following in the footsteps of last year's 80-minute speech. ABC News' Alexander Mallin and Stephanie Ebbs contributed to this report. 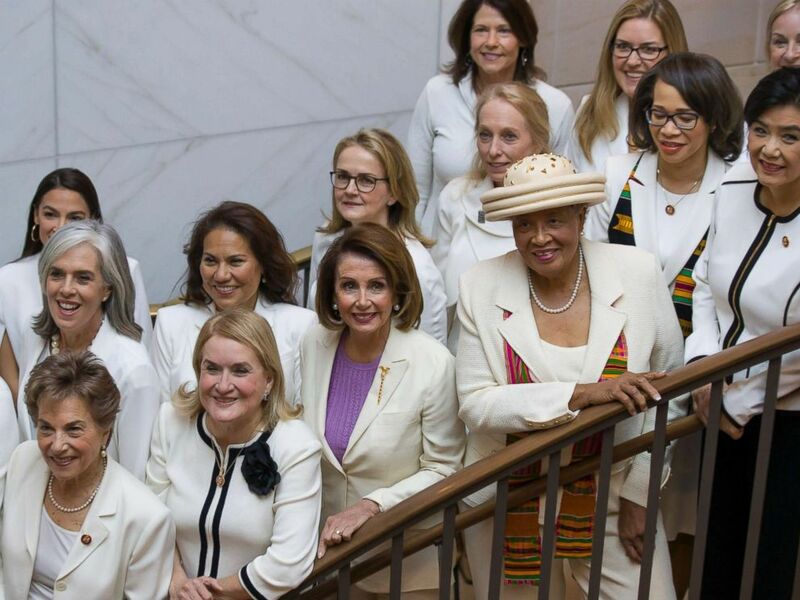 Many lawmakers will be wearing white, a nod to the women's suffrage movement. The effort, Hoyer said, "sends a respectful message that House Democrats stand with women across the country and will continue to defend their rights." Many of the diverse freshmen House Democrats are using their attendance to make political statements. New York Rep. Alexandria Ocasio-Cortez is bringing Ana Maria Archila, the woman who confronted then-Sen. Jeff Flake, a Republican from Arizona, about sexual assault on an elevator on Capitol Hill during Supreme Court Justice Brett Kavanaugh's Senate confirmation hearings. At least four lawmakers have announced their guests are either active-duty or veteran transgender service members. Trump's plan to restrict service by transgender men and women is currently held up in the courts. "Just like in past years, I plan to skip a speech that will be filled with lies, deception and divisiveness," Blumenauer said in a statement. One thing that's not new? Former presidential candidate Sen. Bernie Sanders also will deliver a response to Trump's State of the Union address Tuesday night, something he's done three years in a row, through a live stream on social media. 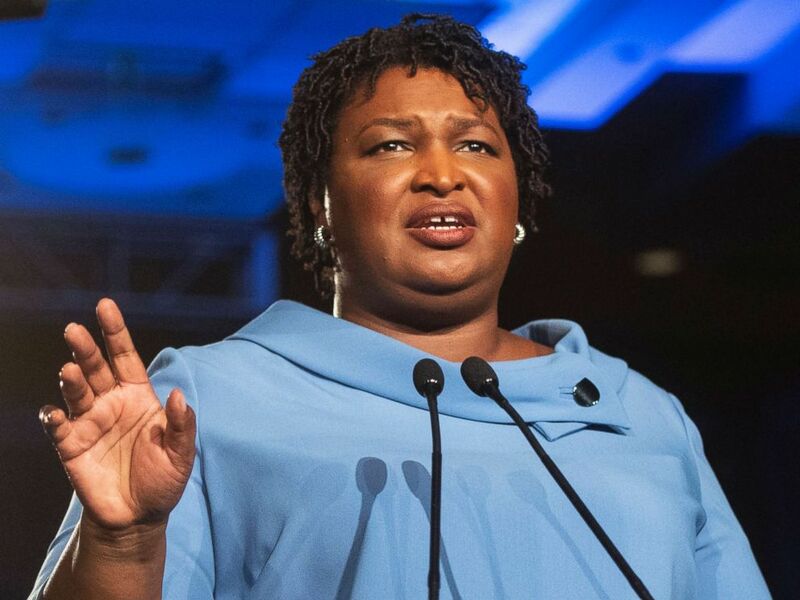 He'll speak after Abrams. ABC News' Alexander Mallin, Devin Dwyer, Sarah Kolinovsky and Stephanie Ebbs contributed to this report.